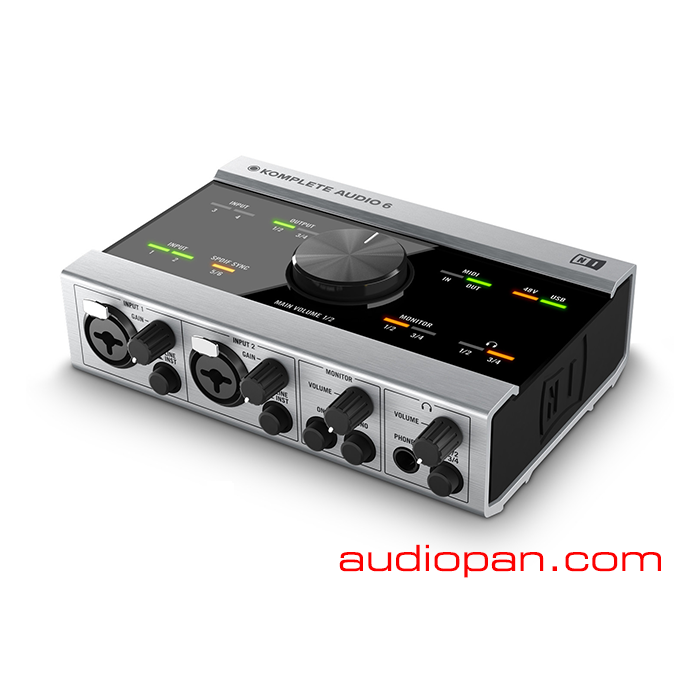 * Get flexible connectivity, pristine sound and a host of included software with this low-latency interface. * KOMPLETE never sounded so good. KOMPLETE AUDIO 6 lets you experience every facet of your sound, whether you’re playing virtual instruments or recording audio. After all, if you’re using MASCHINE or KOMPLETE Instruments and Effects, you’re armed with an array of sounds in the highest-possible audio fidelity. KOMPLETE AUDIO 6 gives you the hardware to match. Pristine sound doesn’t happen by accident — it’s the result of knowledge, experience and close attention to detail. KOMPLETE AUDIO 6 has been designed in-house by NATIVE INSTRUMENTS, and takes the already award-winning sound quality of the AUDIO KONTROL 1 to a new level. From the custom, streamlined circuit design, through the hand-picked components to the analog volume knob on top of the unit — every part of the interface is designed to preserve signal clarity.